- We choose environmentally friendly materials so that you and your family can safely use our cabinets. Lightweight components can be easily assembled and disassembled in a brief time. Save your room space and time. - Our HOMFA cabinet ample storage, excellent stability and easy maintenance. You can enjoy the fun of DIY to creative more creative style by yourself. - Warm and unique shape design makes our Multi-function Cube not only a large storage capacity, but also a delicate decoration. 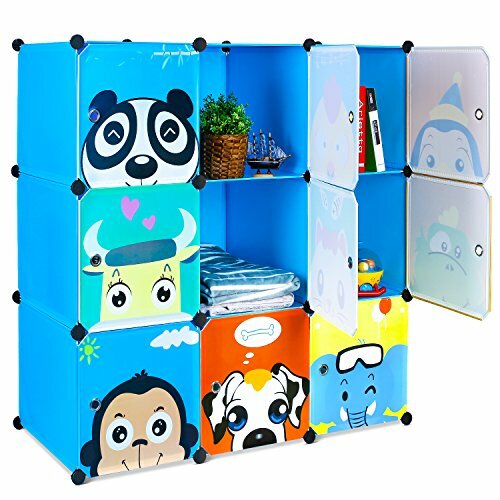 Often used as a children's bookcase, toy rack and personal storage organizer. - This cabinet is waterproof and easy to clean, sturdy enough to bear 20 lbs items. ENJOY THE FUN OF DIY: Our HOMFA plastic wardrobe can be assembled various style of you need, you only need to do is assemble the PP board with your connector and assemble it into a different shape. Fit into different places with different styles of decoration. Whether it's in the living room, bedroom or office. EASY CLEANING: Our cabinet surface is made of environmentally friendly PP plastic, so that the shoe shelf is resistant to chemical corrosion, non-toxic, anti-rust, anti-mildew, moisture-proof and dust proof. It is waterproof and easy to wipe. SOLID & DURABLE: Made from high quality material-- eco-friendly PP material and plastic connectors, keep the PP board and connector securely together. This Cube Organizer is Eco-friendly and harmless to both you and your family. BULK STORAGE: Our 9-cube cabinet size is 14"(L) x18.5"(Deep)x14"(H). Each cube supports up to 22 lbs that can meet the spring to winter long storage of clothing needs. Doors feature a hole handle for air circulation preventing buildup odor.